You cannot add "Games World of Puzzles January 2019" to the cart because the product is out of stock. 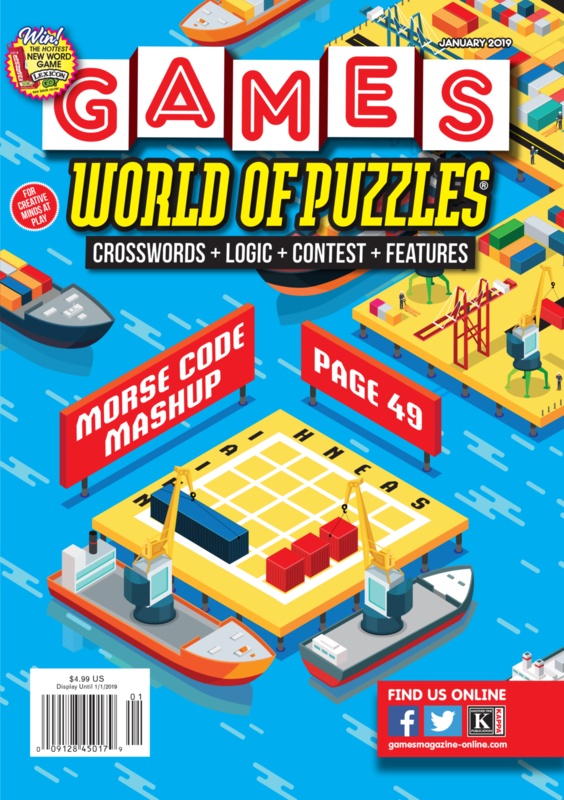 Here’s a little treat to help you ring in the New Year: the January 2019 issue of GAMES WORLD OF PUZZLES! I’m delighted to share this issue with you. In addition to the challenging puzzles you love to tackle, it includes some great articles and fantastic features. You may not have noticed, but this past August an important event in the gaming world took place: The iconic collectible card game Magic: The Gathering celebrated its 25th anniversary. Even if you don’t play the game yourself, you probably know someone who does. By any standard, Magic has been a runaway success. In our feature article “Magic: The Gathering Turns 25,” our game reviewer Thomas L. McDonald explores the development of the game from its release in 1993 to the present day. If you’re wondering what’s next for this wildly popular franchise, turn to page 34 and read all about it. Cards are, in a way, also the subject of Raymond Simon’s contribution to this issue. Simon, who usually collects quirky items for his regular Game On column, came up with a topic that deserved a bit more space: the state of Delaware’s “cold case cards.” These decks of playing cards may, law enforcement officials hope, help to close some investigations that have been hampered by a lack of evidence or eyewitnesses (page 48). Of course, it’s refreshing to see an example of games being used for a serious purpose in the real world, but we’re here primarily for fun. Ever stop to consider board games trying to piggyback on an author’s literary cachet? Jonathan Schmalzbach has! The result of his deep dive in the library stacks can be found on page 41. And Scott Appel, our Scrabble correspondent, reports on a nail-biting upset at the recent North American Scrabble Championship, where Malaysia’s seemingly unbeatable Nigel Richards was vanquished by a hero from the Bronx (page 42). We suspect your New Year’s resolutions include sharpening your wits, so for word aficionados we recommend Adam Fromm’s “Window Boxes” (page 22) and Erich Friedman’s “Road Blocks” (page 50). Those who prefer math and logic might want to start with Andrew Parr’s “Morse Code Mashup” (page 49) or Ryan Langewisch’s “Logisquares” (page 64). Wherever you begin, you’re sure to find a wealth of puzzling fun in the pages ahead. Finally, an announcement: Longtime GAMES editor in chief R. Wayne Schmittberger has created an app called Square Routes that is now available at the Apple App Store! It’s free, and after you do the first 15 puzzles you can buy two sets of 50 more puzzles for $1.99 each. Here is the link: https://itunes.apple.com/us/app/square-routes/id990472246?mt=8&at=11l5LS. This Old Game: What the Dickens?